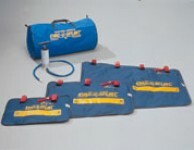 Immobilization Kit is for Ambulances, Schools, Outfitters, Remote Locations and Lodges. The Evac-U-Splint Kit is lightweight Hartwell Medical Splint which effectively immobilizes the patient without placing undue pressure on the injured area. Eliminates Axial, Laterial, and Rotational Movement during normal patient transport. 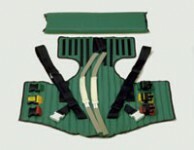 This kit includes a KED (Kendrick Extrication Device) which is a means of immobilizing and extricating Patients. Has wrap-around-jacket, adjustable neck roll, and 2 forehead/chin straps. This design permits a versatile splinting device for suspected rib fractures, hip fractures, or pelvic fractures. 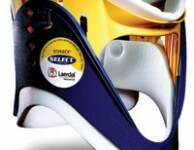 A Sager Traction Splint. One person application in 30-45. Can be applied to a patient in any position. Extrication Collar which is adjustable and other items listed. Carrying case included. Elastic Wraps 6" & 3"